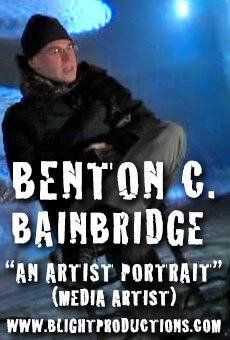 Benton C Bainbridge is an artist based in The Bronx working with video as a painterly and performable medium. His media art is made with custom systems of his own design. Bainbridge has presented video as immersive environments and live compositions across 5 continents, collaborating with scores of artists around the world. Career highlights include the best-attended ever Whitney Museum of American Art at Philip Morris performance with live media ensemble The Poool, video design for 2 Beastie Boys world tours and numerous special appearances and analog video synth FX for TV On The Radio. Bainbridge has shown and performed video on five continents in venues including the Whitney Museum of American Art at Philip Morris, Museum of Modern Art, Lincoln Center, Madison Square Garden, American Museum of the Moving Image, The Kitchen (NYC), EMPAC (Troy, NY), the American Museum of Natural History, SFMoMA (San Francisco), Hirshhorn Museum and Sculpture Garden (Washington, D.C.), Dallas Video Festival, Boston Cyberarts Festival, Mercat des les Flors (Barcelona), LUX2006 (Sevilla), Auditorium Parco della Musica (Roma), Test-Portal (Amsterdam), Wien Moderne (Vienna), Inventionen (Berlin), Teatro Colón CETC (Buenos Aires), CELCIT (Managua), Korean Festival (Seoul), Good Vibrations (Australia), MTV Networks and Hotwired (global). This year, Benton C Bainbridge has shown projections with Jin Hi Kim’ at The Metropolitan Museum of Art and Kaki King at BRIC in Brooklyn. He premiered “Picturing You”, an interactive video portraiture installation commissioned by Deutsche Bank for Frieze Art Fair, NY. Picturing You can be experienced at the “Performing Media” exhibition at Everson Museum in Syracuse, NY. Bainbridge was a founding partner in Glowing Pictures from 2004 through mid 2014. Support us at www.patreon.com/blightproductions so we can explore the minds and work of more amazing artists like this!! !